Depending on the outcome of Groundhog Day, it’s a little late in the season to be eating butternut squash & apple soup. If there are six more weeks of winter to look forward to, though, this silky soup is ideal. Ah, Groundhog Day. That strange holiday where we depend on a single mammal to predict the weather. Does anyone know why this is still a thing? I mean I understand the historical significance. 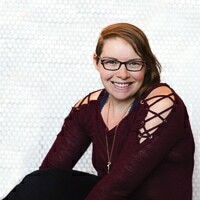 Still, it seems weird that on this one day, we throw on some science-and-common-sense-blocking glasses and pretend that we really trust what Punxsutawney Phil does. I mean, the little ground squirrel is only right about 39% of the time. Less than 50% is less than chance! How many other historical traditions have been tossed out because they’re incredibly ridiculous? Why do we hold on this this one? I’m not sure I’ll ever understand. Regardless of what a groundhog has to say, it’s practically Spring in Fargo already. This may seem cold to some of you, depending on where you live, but last weekend it was 30-40 degrees and sunny. In January! Many people were milling about downtown wearing only long-sleeved shirts or thin hoodies. For reference, we’re used to Januaries that are 60 degrees colder. This entire winter has been very mild for us — only a handful of days have had temps in the single digits or below zero. 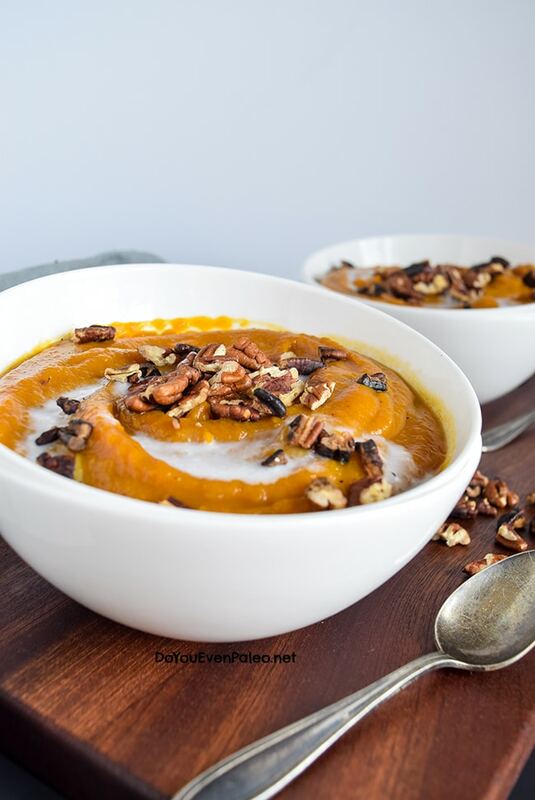 Still, despite the extraordinarily warm winter, the air still holds a chill that makes me yearn for a good soup, and this smooth and silky butternut squash and apple soup recently became a favorite. I’ve realized I’m not the biggest fan of butternut squash…which is a shame because I bought four of them at the last farmer’s market of the year in Autumn. I’ve had a few taking up space in the pantry all winter, and I’ve finally decided to clear them out. Soup seemed to be the best option, since I grow bored of plain butternut squash. 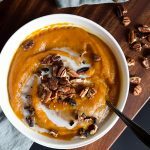 I thought that combining the squash with apples would compliment the nutty and sweet flavors of squash, and boy was I right! If it weren’t for my well-trained common sense, I could probably have eaten the entire batch of soup in one sitting. So smooth. So warm. So comforting. So winter. And the toasted pecans just added another layer of warmth and charm. This soup is truly amazing, everyone. Give it a try and let me know what you think! As a note — I’m guessing you can convert this into a crockpot recipe. You’d just have to leave it in the crockpot long enough for the squash and apples to soften before blending. 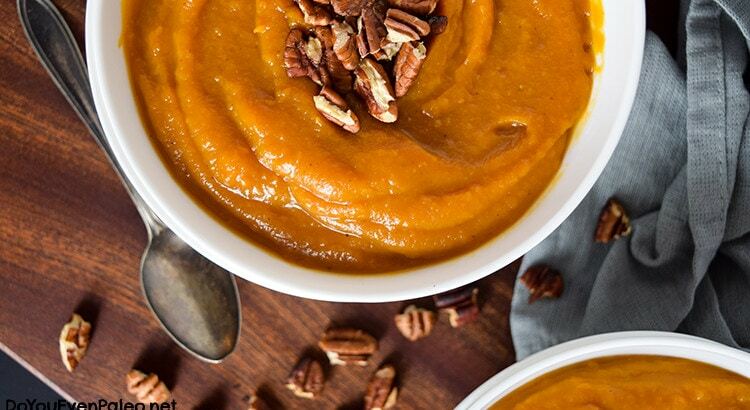 An immersion blender makes quick work of this silky smooth butternut squash and apple soup. A comforting favorite in the winter! Heat a large, deep pot to medium heat and add the broth, coconut milk, butternut squash, and apples. Increase the heat to medium-high until the broth/coconut milk mixture starts to boil. Boil for 1-2 minutes, then decrease the heat to low. Cover the pot and let simmer for about 30 minutes, stirring occasionally, or until squash and apples are soft and slide off easily when pierced by a fork. Add nutmeg and allspice. Remove from heat and let cool slightly while you prepare the pecans. Roughly chop the pecans. Heat a skillet over medium-low heat, then add the coconut oil and let melt. Add the chopped pecans and stir to coat in coconut oil. Toast for 3-5 minutes or until browned and fragrant. Remove from heat. 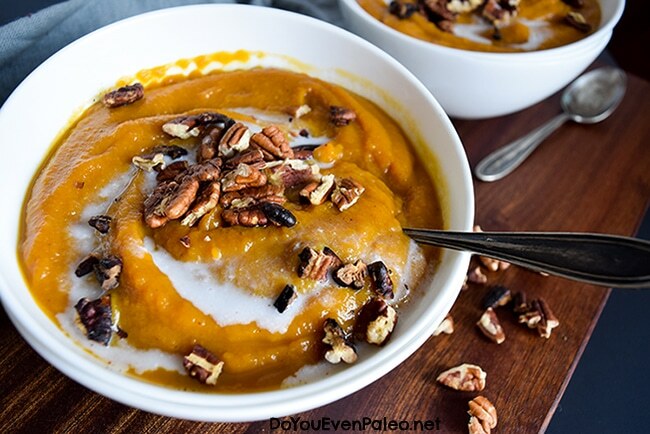 Using an immersion blender, blend the squash and apple mixture until completely smooth. Alternatively, if you don’t have an immersion blender, add the soup in batches to a blender or food processor and blend until smooth. 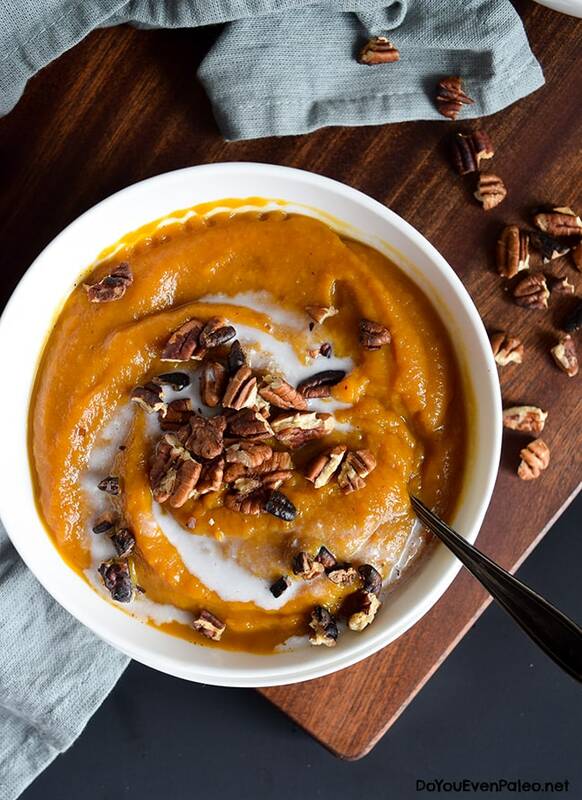 Ladle into bowls and garnish with a handful of toasted pecans and a drizzle of coconut milk just before serving. To speed things along, you can use leftover roasted butternut squash. If you opt to do this, just reduce the simmer time to about 10 minutes or until the apples are soft. 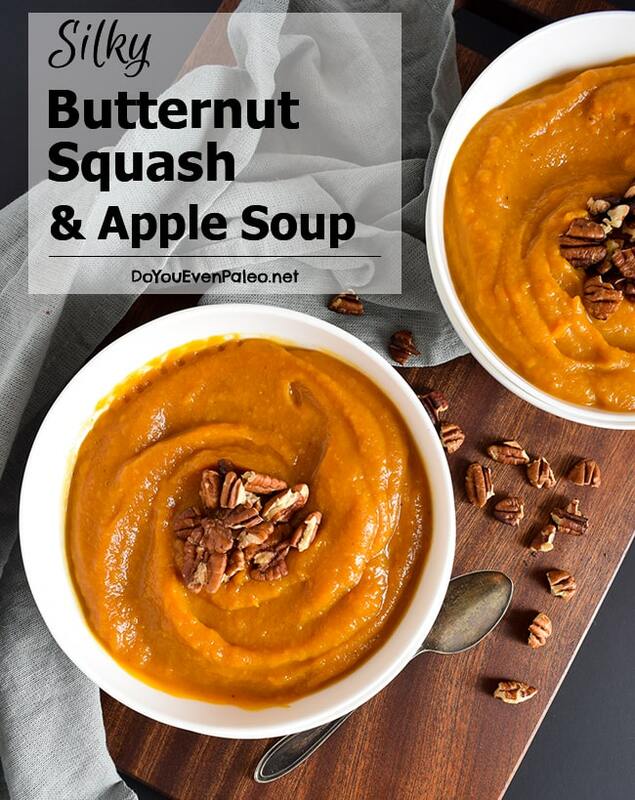 Got a sore throat and was feeling under the weather the whole day, but this sounds like a fantastic idea for a warm and flavorful soup! Hopefully, just the thing to get me feeling good for tomorrow’s workout. Got any other interesting ideas for soup? Oh no! I hope you feel better soon. Soup is ALWAYS the best idea when you’re feeling sick! Don't subscribe All Replies to my comments Notify me of followup comments via e-mail. 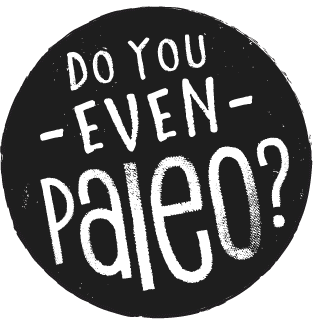 You can also <a href='https://www.doyouevenpaleo.net/comment-subscriptions/?srp=1348&srk=87505361eee98908ddf6ccb8681f50d6&sra=s&srsrc=f'>subscribe</a> without commenting.